This spring - while you were all relaxing on your boat - we were making holiday plans for the summer. Three weeks with no boats (well, we’ll maybe sneak in a few), just enjoying time with the family. After sifting through a whole pile of options online, we decided to go to Denmark for one week, spend one week at home and go cruising on the Meuse in Limburg for one week. I don’t want to tell you about the last item just now. You do know that. “But Denmark?”, I hear you say. Yes, Denmark. Billund, to be precise. Those in the know will have got it by now. Correct. Legoland! An experience for young and old. An adventure. And, as a marketeer, I’m also curious to know how they approach the whole thing. So, we booked it: holiday village including a pass for the park. August soon came around and it was time to go. Our son (3,5) was keen to go as Lego (Duplo) is his favourite toy. Our daughter (1) simply went along with it but doesn’t really understand it all yet. After a seven-hour journey, we arrived in ‘our’ house. It’s a great holiday village, with pleasant chalets, and there’s a good atmosphere. We had a good sleep and then got up and headed for Legoland. Once in the park, we couldn’t believe our eyes. We had never seen so many Lego bricks all in one place before! And the buildings were really fantastic. 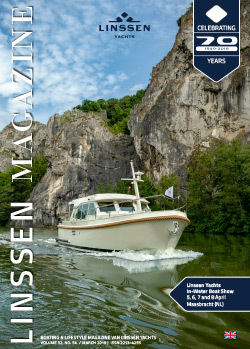 But then came the highlight and, yes... it was a genuine Linssen! Wow, we were impressed. A Linssen in Legoland, that’s really something. Straightaway we were sending photos to the family and the team via Whatsapp. Everyone was enthusiastic. On Facebook, people were debating what type it was. But dad and I agreed – it’s a 44 SE (see photograph). It was fantastic to see it. I’m curious to know what motivated Legoland’s management. (This magazine will be posted to them – we’ll keep you informed). What’s more, Jac Linssen – who happened to stumble across Legoland in Germany on his way back from holiday – reported that there were actually two Linssens in the German Legoland near Ulm. I’m hoping there’s a huge Linssen fan out there who would like to upgrade the mini-Linssen range in Legoland as well. In any case, we’re happy to build along!